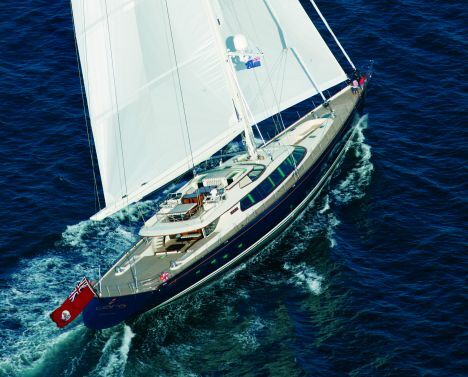 "Tiara" is the last boat built by the Kiwi shipyard Alloy Yachts. Designed by Dubois Naval Architects, this yacht is the number 28 of the Alloy production and it is the biggest ever built by the yard as well as the biggest sailing yacht ever launched in New Zealand. Freshwater tanks: 10,000 liters (2,642 gallons). Alloy Yachts; p.o. box 21480; Henderson, Auckland; tel. 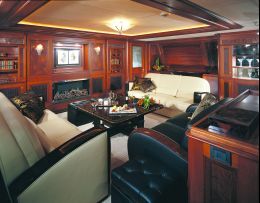 +64 9 838 7350; fax +64 9 838 7393; web site: www.alloyyachts.com; e-mail: mailbox@alloyyachts.co.nz. Nevertheless, Alloy Yachts is not new to such records, in fact with "Tiara" it beats its own records set with "Salperton", a 53-meter ketch launched in 2003 described in the pages of previous issues of our magazine. The shipyard set a new record with "Tiara": it is the biggest sloop ever built capable of passing under the American bridges before entering the Panama Canal. When the Owner of "Tiara", a Swiss architect, decided to build his boat in the Kiwi shipyard, he challenged the designers by requesting a sloop capable of offering comfortable life on board as well as exciting performance under sail. The Swiss professional, a great appreciator of the shipyard, was particularly fascinated by the two previous Alloy yachts, the sloop "Georgia" and the ketch "Salperton". Works started in February 2002 and the yacht was launched twenty-five months later, in March of this year. "Tiara"'s construction required 430,000 hours of labor, 120,000 kg (264,317 lbs) of aluminum, 6,000 m (19,685 ft) of teak laminate, 22,000 m (72,178 ft) of cables for electronic connections and 50,000 m (164,042 ft) of electric cables. These numbers suggest, at least partially, the scope of the undertaking beyond the length of the boat, which in all cases, clearly expresses the imposingness of "Tiara" with an overall length of 54.27 m (178 ft). As mentioned above, by requesting high performances under sail, the Owner obliged the designers to create a powerful sail plan supported by adequate appendixes which, nevertheless, were in contrast with other requests made by the customer, such as being able to sail in not so deep water. In order to meet such requests, the designers created a mobile keel with a maximum draft of approx. 8 m (26 ft) and a minimum one of slightly above 5 m (16 ft. 6 in.). Are these all the innovations introduced with "Tiara" by Alloy Yachts in the fantastic world of yachting? Absolutely not. By looking at the yacht, the surprises seem to be endless. 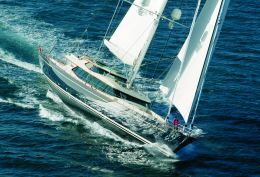 Tiara is the only sailing yacht in the world to have a helipad and the first Alloy yacht to have vertical stainless steel winches fitted with the Alloy Yachts Sea Touch command produced by the yard. 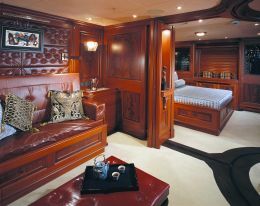 This is not all though, the interiors description tells the reader how extraordinary this yacht is. As for the aluminum hull, the yard carried out several model tests to verify its hydrodynamic efficiency and to improve performance by maintaining the greatest possible volumes. The Dubois Naval Architects team worked intensely to obtain two and a half decks yet maintaining a low profile. The photographs show how this objective was reached. Ed Dubois, the design team manager, said that designing a yacht capable of efficiently meeting all the requests made by the Owner requires a lot of work and keen study, most of all in this case, where everything must contribute to an attractive design and where practical elements risk to be spoil it. As a matter of fact, the risk of ruining the image that Owner and designer had of "Tiara" before completing her was possible. After model testing, which showed that the hull is capable of offering even higher performances than those requested by the client, the yard's construction team started working on the interiors designed by John Munford Design. 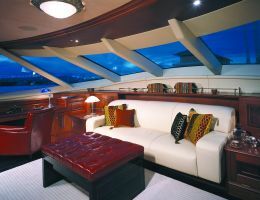 The boat has two decks and a fly bridge - fitted with a double open-air helm station and a comfortable relaxation area. 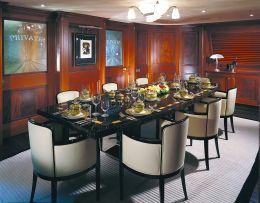 Aft of the main deck there is a spacious helipad for helicopter landing and for the safe transit of guests. The superstructure houses aft a wide open-air relaxation area covered by the extension of the upper deck and embedded on the main deck, so as to be protected from weather whims and intrusive looks. 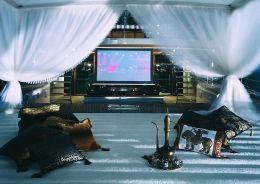 Continuing forward there is the inner salon, extending over the whole width of the deckhouse, including sofas, entertainment systems, bar cabinet and comfortable enough for a considerable number of guests. 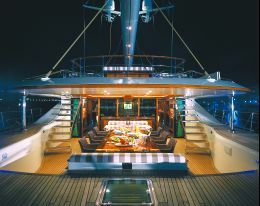 From here one can access the dining room, through two fore-and-aft passages along the perimeter of the helm station which is fitted on a slightly higher level in the center of the yacht. The deckhouse includes forward a technical area for captain and engineer where they can check the state of all onboard systems and of navigation thanks to the touch-screen terminals and to the repeaters of the instruments existing in the helm stations. 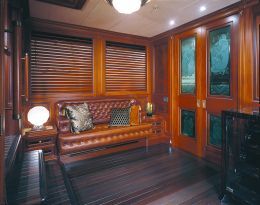 The Owner, guest and crew quarters and the engine room are located in the lower deck. The latter is amidships and houses a 1,400 hp Caterpillar 3412E coupled with a ZF 2560 reduction gear and variable pitch propeller. 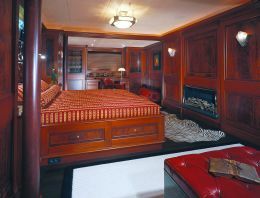 Aft there is the guest area, with two double-bed staterooms - one of which may turn into an office - two twin-bed staterooms and four bathrooms. Forward of the engine room there is the Owner suite, extending over the full breadth of the yacht with the double bed in the middle, office corner, vanity, en suite bathroom with double sink, bath tub and separated shower stall, toilet and bidet. The bow area of the lower deck is entirely dedicated to the crew: an ample space including galley, dining room and relaxation area, a double-bed cabin for the captain, one cabin with single bed and four cabins with twin bunks for the rest of the crew all with en suite bathroom. Tenders and other means of transportation are housed in the ample aft garage and inside an aft locker in the main deck. 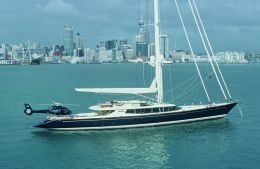 The Kiwi yard, as mentioned at the beginning of the article, set several records but the most important one is that it opened new routes in the vast sea of design. In the future, these innovations will be included in other Alloy Yachts out of which the yard's clients will be able to expect the most.